The hot summer heat can put your lawn to the test and can really defeat it if it is not healthy enough to withstand the brutal beating. Many lawns that are not maintained well from the start will have difficulty surviving a high heat summer. In this post, We will touch on a few tips that will help your lawn stand a chance. Remember, your lawn needs your help in order to look its best during any season. What Really Helps Your Lawn? For starters keeping your lawn maintained regularly helps it to be strong before it encounters those high heat days. If you are regularly keeping it cut and watered properly, this is like having a lawn that works out at the gym. It is ready to stand up to the elements. 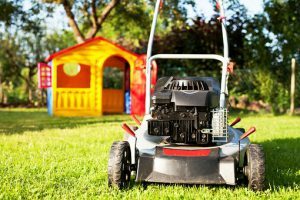 Keeping it maintained means you are not waiting till it gets so long you have to cut off an inch when you mow and making sure it is watered correctly so the roots are moistened well but not often. These are a couple of key factors amongst other things. If you read any of my other posts you remember me mentioning the 1/3 rule and the deep watering over frequent watering. These two are very crucial to your lawns success. If you are in a drought situation, wait until you get some rainfall before you attempt to cut your lawn. If you feel you need to cut it, irrigate it yourself prior to cutting it. This will keep you from stressing the grass out to the point that it can’t recover. In extreme heat do not fertilize, aerate or dethatch your lawn. In this type of heat, the lawn certainly could not handle being handled that rough. This is why these things are preferably done in the Spring & Fall. Lastly, when you do cut your lawn don’t bag up the clippings. 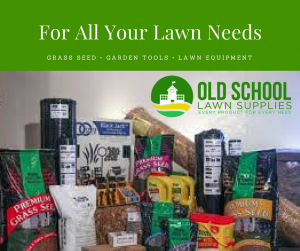 Let them fall into the lawn because this will help to fertilize your lawn as they decompose, they will be putting nourishment back into the lawn. These few steps will help you help your lawn in high heat weather conditions. Thank you for visiting us and I hope this post enlightened you on some of the things you may not be aware of. Please leave any questions or comments below. This is really good if your mower mulches really well. Great informative and helpful post. I have not been taking care of my lawn how it should be taken care of, and it shows. You provided a lot of great do’s and don’t that I need to incorporate immediately, Thanks for sharing. Thank you. Glad the information will help you. Just remember to maintain your yard regularly and you will have most problems beat. You mention cutting the grass regularly. My target is once a week, partly so I will remember! Is there a best time of day to cut grass? My neighbour creates a pattern when he cuts the grass. (Diagonal) does this make difference? Once a week is very good. You should cut it at least every 7 to ten days depending on how much rain you are getting. The best time to cut is early afternoon or mid-evening. The early afternoon will allow any morning dew to dry up and the early evening is better because chances are the heat won’t be so intense. The diagonal cut is basically a preference. It is said to cut your lawn in different directions periodically because it helps the grass stand up. These are some great tips to keep in mind since the summer heat is now up on us. I did not realize that cutting your grass when it is hot and dry can be hard on the lawn. 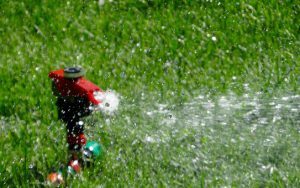 How far in advance should you water the grass before cutting? You can water it and then cut the next day if you like. The key is to make sure that the lawn is dry after you water it. The next day should be long enough before you cut. A great read indeed. Thanks for the wonderful share. Thank you. I always hope the information I write will help someone out. It’s wonderful to hear you enjoyed it. Thank you so much for visiting.